Oats are delicious and also known to be one of the super foods that is good for your health. Oats are rich sources of soluble fiber and this is of great benefit for those who want to lose weight and achieve a well toned and shapely body. The fiber contained in oats creates a gel, which reduces your overall hunger, thus preventing overeating. Having oats keeps you feeling full for a longer time and thus helps you to stick to your diet plan. The health benefits of oats are immense and you can also make delicious recipes with oats. 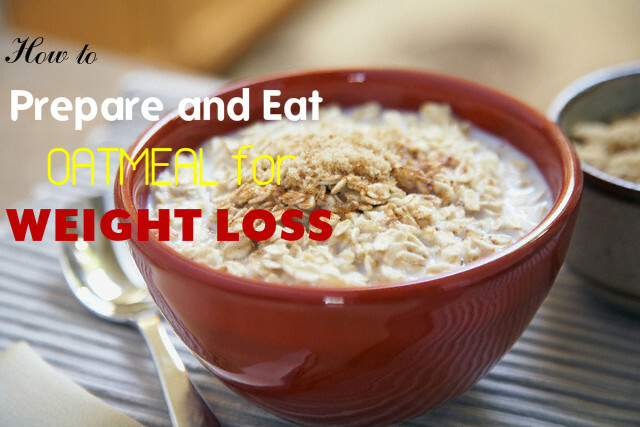 Below are given some ways by which you can consume oats for losing weight. Plain oatmeal: You will get a variety of oatmeal in the market. There are plain oats as well as oats with different flavors. But if you are on a weight loss diet, then you must make sure that you buy plain oatmeal as it contains less calories compared to other types of oatmeal. Flavored oatmeal: flavored oatmeal contains sugar and more calories in it. so, you must never buy flavored oatmeal if you wish to lose a few pounds of your weight. Larger flakes: People often think that larger flakes are old fashioned flakes. But in reality, larger flakes are more beneficial for losing weight. These flakes keep you fuller for a longer period of time than the smaller flakes and thus help you in controlling hunger pangs more effectively. This in turn aids in losing more weight. Steel-cut flakes: you need to spend more time to cook steel-cut flake oatmeal, but they are more delicious and creamy. Its texture is delectable and it is also chewy. This recipe is one of the most popular recipes that you can try with oats. By adding milk or soy milk to oats, you will get the calcium and protein that you need for your body. Adding some fruits to the dish is also good for your health. When you add fruits, make sure that they are note high-calorie fruits. When you add fresh fruits, it not only adds flavor and sweetness to the dish you make, but also provide the antioxidants and other essential nutrients that you need for your body. Try not to add sugar as a sweetener. Instead of sugar, you can add honey to make your dish sweet naturally. It is also a good idea to add some apple cider vinegar to your oats. This makes it tasty and makes your weight loss plan more effective. By adding some jam to your oats and milk recipe, it becomes tastier. You can also use some dry fruits to garnish it. To make dosa with oats and rave, you have to take one cup of oats and grind it to get its powder. Now add ¼ cup each of rice flour and rava to the powdered oats. Take some chillies and an onion and chop them finely and then sauté them in a pan. Add this also to the mixture. Now you have to add cumin seeds, pepper, salt and then mix all the ingredients well using some water. The consistency of the batter must be same as that of the regular dosa you make. After the batter is ready, put a pan on the gas and heat it. Spread the batter on the heated pan in the same way as you do for making regular dosas. This is delicious and good for your health. Take carrots, onions and garlic and chop them finely. Now take a pan and heat some olive oil in the pan. Add garlic first and then the onions and sauté them for a while. Now you have to add carrots and sauté them till the raw smell of the carrots goes off. Add oats and wait for 2 to 3 minutes. Now you can add water and let it get soaked by the vegetables and the oats. Put a lid on the pan and cook it till the vegetables in the pan become a little soft and cooked. Add milk and simmer the contents for another 5 minutes. Add black pepper powder, salt and oregano to the dish you have made. Garnish it with chopped coriander leaves and serve it hot. You will love the taste of this soup. Oats are rich in soluble fiber, which is very beneficial for reducing the levels of blood cholesterol. Oats are very beneficial for slowing down the rise of glucose levels in the blood. As a result, it helps in controlling sudden rise in the levels of blood sugar. Oats contain fiber in high amounts. This is very beneficial for the proper movement of the bowel. If you are suffering from constipation, oats are the best remedy for it. Now that you have seen some of the advantages of oats and the way to prepare some yummy dishes with oats, try it today itself. These recipes will help you lose weight naturally and fast. It has been noted that people who take oats for their breakfast and do proper exercise and go for walks regularly, lose weight faster than others. So, start consuming oats and see how you lose those extra pounds you have so wished to lose.